Electrical Service Upgrade - Do You Need One Now? What Is Your Electrical Service? Your electrical service, commonly called your electrical panel or breaker panel, provides an entry point for electricity to enter your home. Once the electricity reaches your home from your local utility company, your breaker panel serves as the distribution system that controls, maintains and distributes the electrical current to the many circuits in your home. In addition to its role in distributing the power throughout your home, your electrical service also serves as your first line of protection against the dangerously high levels of electricity that are being delivered to your home. Each circuit is protected by a circuit breaker, or fuse if you live in an older home. Whenever electrical current becomes too erratic, or reaches unsafe levels, your breakers are designed to flip to the off position, which will no longer allow current to flow to that circuit. This can help prevent overheating, melting, fire and possible shocks. If you have recently moved into an older home, then you will want to have your electrical panel inspected both for safety and for sufficient supply. Newer electrical panels are installed with many built-in safety features. Many older electrical panels, unfortunately, are not as safe as their modern counterparts. The most common type of outdated electrical service is the fuse box. Other known unsafe electrical panels include Zinsco electrical panels, Pushmatic electric panels and electrical panels built by Federal Pacific Electric Company. 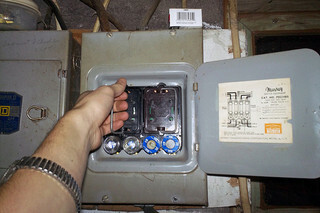 A fuse box utilizes fuses to halt the flow of electricity, rather than a circuit breaker. They accomplish this with the help of a metal filament that is designed to fail and break whenever the electrical current flowing through the fuse reaches a certain level. This will stop the electricity from continuing through that particular circuit. One of the biggest dangers posed by fuse boxes is the temptation to replace blown fuses with oversized replacements. While this may provide you with a greater gap between replacements, it can lead to an overloaded circuit. Most fuse boxes were designed to handle between 30 and 60 amps of power, rather than the 100-200 amps that the average household requires today. This makes oversizing or attempting to bypass a fuse especially hazardous. Your best bet is to upgrade your electrical service, if you live in a home that still has fuses.